The rhubarb plant is an annual crop that, if you treat it right can be grown all summer long as long as it doesn't freeze. This plant when grown in ideal conditions, grows large leaves and stems. They can get quite bushy if you let them. The edible part of the rhubarb is the stem all other parts are poisonous. Not saying that you will fall over dead from just a nibble of a leaf, but it would be best not to eat anything but the stems. The stems themselves are very sour so they need to be cooked with sugar, and have been made into pies and jellies. The pies are often mixed with some other fruit like apples or strawberries to lessen the sour of the rhubarb. If you are someone who can't stand sour then this might not be the plant for you to grow, but if you do then you are in for a sour heaven. Mulching and Composting A lot! One of the most important things that you can do to make your rhubarb grow is to mulch it. A lot. You want to put loads, and loads of compost and mulch on the rhubarb. Of course you don't want to burn the plants or the leaves, but the leaves are just about the only thing that you can burn with mulch. Don't worry about over fertilizing a rhubarb plant. It is all but impossible to do, and the darker and richer the dirt the better for the plants. This is one of the best ways to make a listless rhubarb plant burst into leafy action, and you know that where there are leaves there are stems. If you are trying to get the rhubarb to continue giving out stems, and leaves all season long you really want to get rid of any flowers or flower-heads that you see starting to grow on the plants. The movie above shows you pretty well what these will look like when they start coming on. If you don't get rid of these flowers the plants wont continue to grow past spring, and your rhubarb patch will get really boring for the rest of the year. Just as a note for people who don't know. 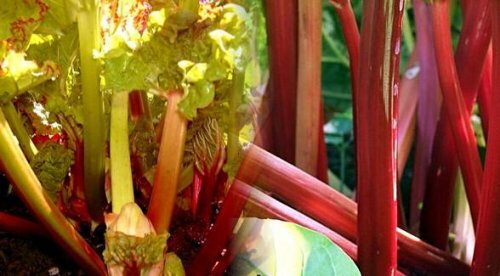 Don't worry too much if your rhubarb stems aren't the ideal bright red. There are different types of rhubarb out there, and many of them are naturally green. The classical ideal rhubarb that you see pictured is often red, but don't think its unripe or something if it stays green. There is no such thing as an unripe rhubarb stem. Not saying that you should cut the small stems. If the small stems are still growing then let them be until they are bigger just so you can have a thicker stem. I have rhubarb growing in an old fridge and the frost is the hardest part of growing. I love cooking it and eating with custard. Hi--I ate a lot of raw rhubarb as a kid from my grandmother's yard. I will still buy it from the store now and then and eat it raw with salt, the way I like it best. Anyway, good article, gave me lots of memories, and two big thumbs up for U.